Two years ago, Tesla Motors (s TSLA) was a struggling electric auto maker startup, backed by venture capitalists, hoping for government loans and trying to keep on schedule of getting its inaugural EV sports car into customers hands. Today, it was very clear during a rare tour of the company’s Palo Alto, Calif. headquarters, complete with factory and lab space, that the company, flush with its IPO proceeds, is spending a whole lot of money ramping up staff and developing the next-generation technology for its EV sedan the Model S, in order to achieve one major goal: cross the chasm from Valley startup into competing on the mainstream big auto stage. One of the goals on the other side of that divide includes growing the company to close to 2,000 employees by the time the Model S goes on sale by the end of 2012: over double of what the staff size is today, executives noted during the tour. Peter Rawlinson, Tesla’s VP and chief engineer said the company is picking off the best from the auto industry, Formula One racing, suspension design, etc., during a talk about the Model S design. 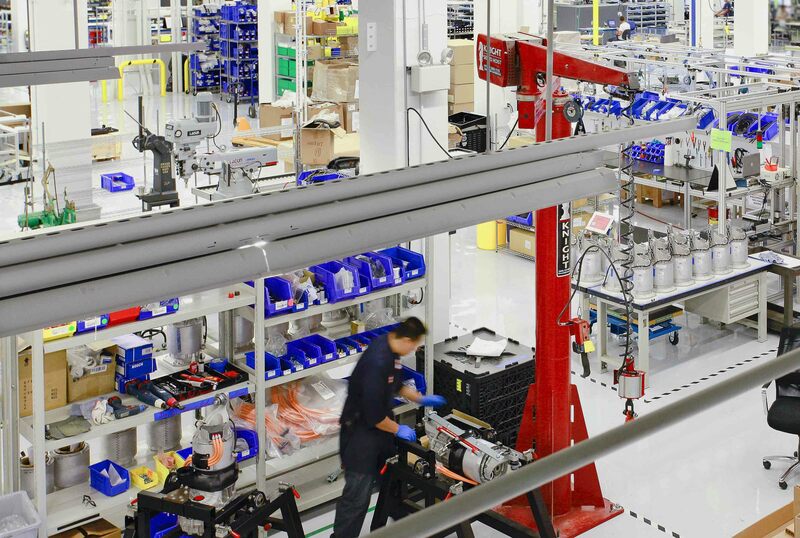 While the Palo Alto headquarters will add about 200 more people, bringing the total to 700 there, Tesla’s new NUMMI plant will be the place where most of the new staff will be brought on, said Dorian West, Tesla director and battery engineer. 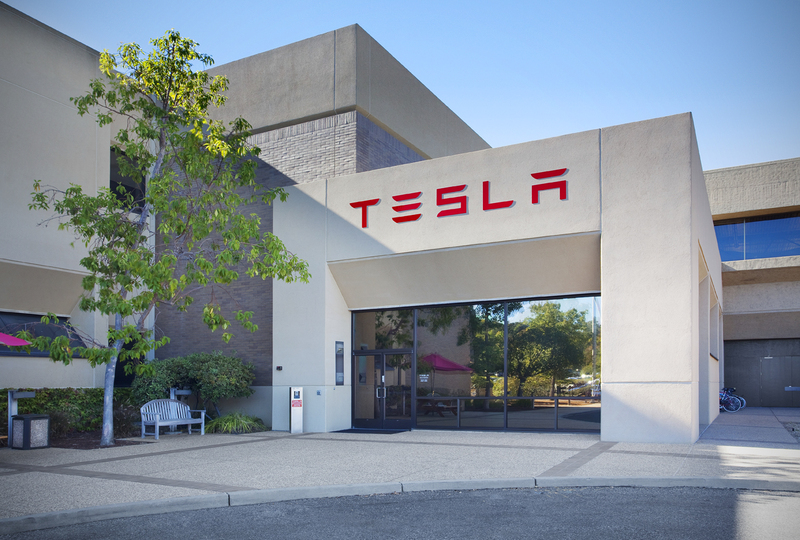 Shortly before Tesla’s IPO, the company announced it had plans to buy the NUMMI plant in Fremont, Calif. (formerly the home of Toyota’s joint venture with General Motors), and over the next year, will be pumping a good portion of the IPO earnings into retooling the plant to produce the Model S.
Over the past 6 months, Tesla has clearly been investing in the research and development and testing capabilities of its Palo Alto labs and factory. The basement of the facility is filled with an auto engineer’s dream playground. It includes a machinist shop, where the in-house machinist makes prototypes for engineers; 3 (soon to be 4) dynomometers to test out motors; and a massive vibration table that jars test batteries under extreme temperature and physical conditions. The majority of Tesla’s patents — and the way it hopes to stay ahead of the competition — will be in its battery technology development. West walked us around the battery testing labs (which he manages), where Tesla is testing the capabilities of its vendors’ batteries, and also comparing them to large form factor batteries being used by competitors, like the Nissan LEAF and the Mitsubishi iMiev . (Both those competitors batteries were in Tesla’s labs.) “If they’re making lithium-ion batteries, we’re testing them out here,” said Tesla VP of Communications Ricardo Reyes. The number of tools in “the basement” is growing so fast that West noted most of the crew working upstairs hadn’t yet seen many of the newest supplies, and Reyes said the place looked different every time he went down there. In fact, the Tesla Palo Alto facility uses 15 MW of power, said West, as he walked the tour into what was basically a mini substation in the basement. For context, West explained, 15 MW is about 5 to 10 percent of the total power capacity of all of Palo Alto. While the Roadster is a car for rich early adopters, reaching the other side of the startup to big auto divide will require the bridge of the more mainstream Model S, which Tesla plans to produce at 20,000 cars per year. The Model S needs “to compete on a level playing field with all of the high value brands, not pandering to green credentials,” said Rawlinson. Tesla is billing the Model S as one of the first mainstream EVs designed and built as an electric vehicle (instead of just slapping a battery in a traditional car) and the first electric car with a design based on so much real world driving data. Tesla has logged over 7 million cumulative miles via its 1200 or so Roadsters on the roads, and when Tesla technicians service the cars they can download information, such as how the Roadster batteries perform in various conditions. That means Tesla has been able to use hard data to tweak the design of the Model S based on one of the largest bodies of knowledge regarding how EVs drive in everyday life. The result is a Model S design that’s based around the battery, in a way few electric cars have been designed to date. The battery of the Model S uses more battery cells than the Roadster (more than 6,000 cells), has a bigger range than the Roadster (300 miles), and is thinner and longer than the Roadster’s battery, which is placed at the back of the car. 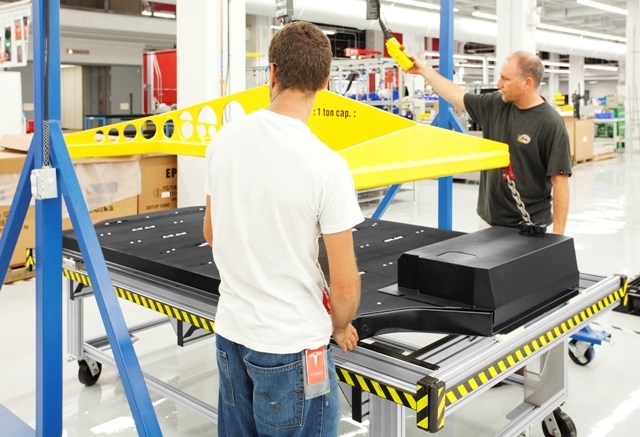 Instead, the Model S battery is placed underneath the car, and the vehicle is designed with the battery as the core and anchor. The placement of the Model S battery makes the under tray of the Model S completely flat, making it very aerodynamic. 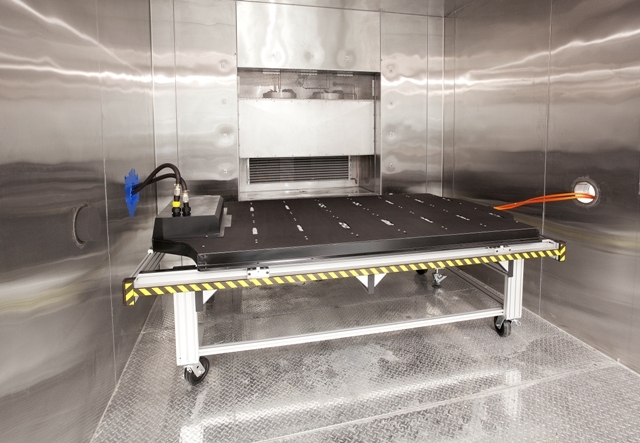 “The drag coefficient is best in class by a margin,” said Rawlinson. The battery also helps with what’s called torsional stiffness, or the way the body of the car feels when maneuvering, and Rawlinson said the battery helps with the Model S’s feeling of “stiffness,” and “isolation from the road.” The battery even adds to the safety of the Model S, said Rawlinson, because of the way it’s bolted to the structure of the car. Tesla is in a sort of honeymoon phase right now. The company bucked all odds to win government loans, have a successful IPO and manage to clinch deals with large automakers Toyota and Daimler. However, those steps are actually just the first battles in the war to be able to compete head to head as, and against, mainstream auto makers. The Model S won’t go into production for at least two years, so Tesla will be spending its next phase of life growing dramatically and trying to extend the honeymoon phase as long as possible. Hence, the press junket this week. They’re in a happy place right now; why not show it off? The reminder of how hard it is to be a big automaker is always on the horizon. Earlier this week, Tesla recalled some 439 Roadsters because of safety concerns about a cable that could cause a fire: Tesla’s second recall in two years (remember this is on the order of 1200 or so cars). I didn’t hear any of the journalists ask many questions about the recall. We were all too busy looking at the swanky new machines. The “becoming” part still stops well short of Big Auto. Another order or two of magnitude, there. But nothing is known about the follow-on family sedan, so it’s understandable. That’s where “the rubber meets the road”, though. …and, Tesla will do this how? As a long-time fan of Musk’s, of Tesla MC, EVs in general, and as a potential investor in TSLA, I was really looking forward to reading this article. Because of its title. I appreciate the time it took to tour the facility, reading the anecdotes and factoids gathered from that visit, but the headline’s promise wasn’t delivered by the article. So, that’s a long-winded way of saying: You got me, I bit! This is a great piece Katie, very good read. @Garry G, very true, my article’s scenario is going to be really hard. thanks for the comment. @jay, I saw on their list of vendor testing batteries they didn’t name any U.S. companies (they were marked by country of origin). But one Tesla exec in the battery lab pointed out where A123 would be if they were on that chart (so clearly he knew the characteristics of the batteries), and said the batteries weren’t in the sweet spot of characteristics for what they were looking for. Love your work Katie– but I just don’t see this future unfolding. It’s a great viral headline for the web crowd who is interested in cleantech… but there is a long hard road ahead for Tesla. The most probable future for EVs is the integration of batteries, fuel cells and capacitors. We are in Year One with the transition – and integration of storage/fueling systems seems to be clear investment strategy for industry. Tesla seems to have placed a niche bet for early generation EVs. The notion of a plug-in EV works ok with fleets- but it’s hard to imagine automakers (who care about cost/mass) and molecule fuel incumbents (who will beat the pants off fixed grid infrastructure) choosing pure battery play. I’m puzzled why so many people just assume EVs will not be fueled? While Tesla seems to have placed their bet on plug in… GM, Toyota, Honda are betting on integration of systems and a fueling future for EVs. So I wish them the best, but I’d love to see the EV conversation broaden its scope of possible futures beyond Tesla and Better Place. I think we’ll be pleasantly surprised at big autos ability to transition when all the pieces for the new foundation are in place. thanks Katie, I will have to pay more attention to them from now on. did you notice if they had any batteries from Valence or A123 there. I wonder if they are testing any from american companies.